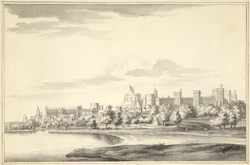 View of Windsor Castle showing the riverbank and castlescape, in particular the Round Tower, the height of which was raised during Jeffrey Wyattville's Gothic rebuilding of the castle in the 1820s. After visiting Windsor Castle in the early 18th century, Daniel Defoe opined that it was "the most beautiful, and most pleasantly situated castle, and royal palace, in the whole isle of Britain". Parts of Windsor Castle date back to the reign of Henry II in the 12th century, when the first stone structure was established. This was the subject of substantial rebuilding in the reigns of Henry III, who built new domestic buildings; Edward IV, who built St George's Chapel; and Charles II, who started a 10-year rebuilding programme. During the 18th century, the castle was generally well maintained, although it was not a popular residence for Hanoverian monarchs. It was not until 1800 that architect James Wyatt was employed to start rebuilding the castle in Gothic style.